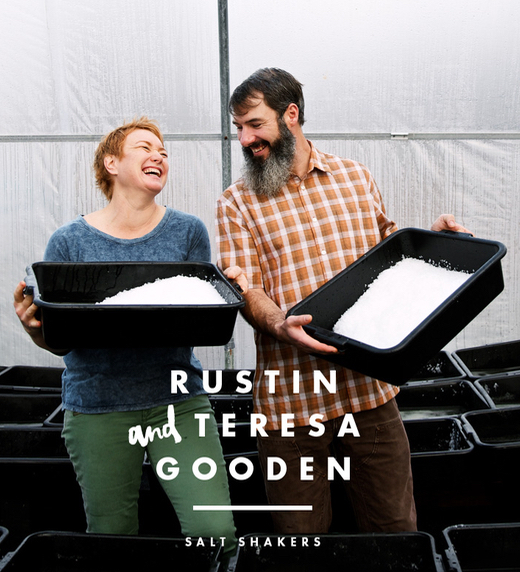 Teresa & Rustin Gooden at Bulls Bay Saltworks, holding pans of freshly harvested sea salt. Photo by Olivia Rae James for Charlie Magazine, 2015. The directions read: Turn right at the Red Mailbox. But it was so tiny that B and I almost missed it. We were looking for a giant red mailbox, or maybe a roadside gas station by that name. It was a balmy early February day in South Carolina and we were on our way to Bulls Bay Saltworks, 28 miles up the coast from Charleston. The occasion? 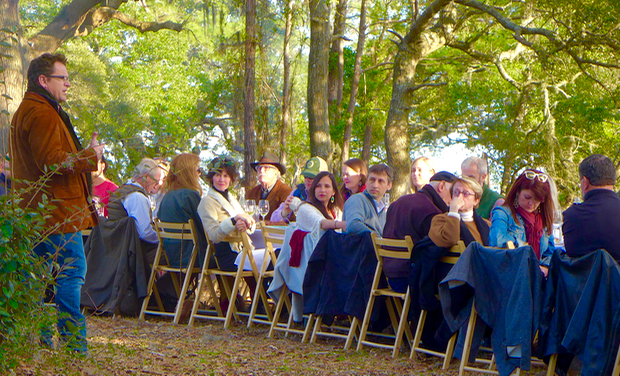 One of those picture-perfect farm-to-table dinners staged by Outstanding in the Field. 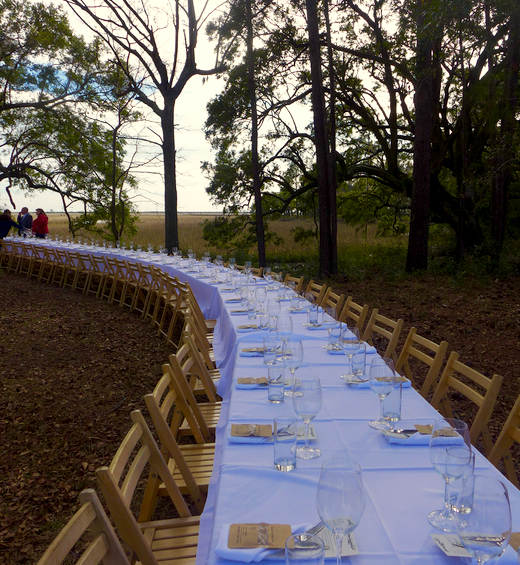 You may have seen those seductive photos on-line: long (very long) tables set for a hundred or so food-obsessed diners in impossibly gorgeous locations–an oyster farm on Puget Sound, a Wyoming ranch near the Tetons, a fruit orchard in the Hudson Valley, even the foothills of Mount Fuji in Japan. 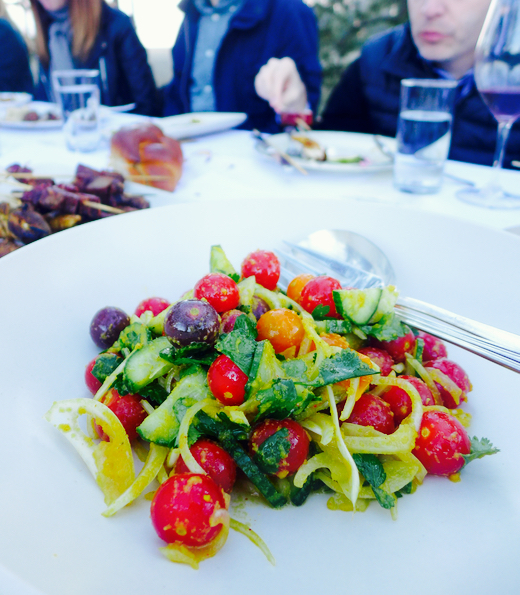 OITF calls itself a “roving culinary adventure–literally a restaurant without walls.” Staffers travel around the country, usually in an old bus, staging events in Northern California, the Florida Panhandle, and dozens of spots in between. 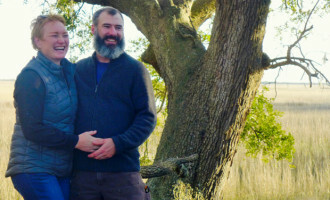 Each dinner aims to “re-connect diners to the land and the origins of their food, and to honor the farmers and food artisans who cultivate it.” Tickets, which start at $190, can sell out in the time it takes me to inhale my morning capuccino. But let’s get back to Bulls Bay. Two Sundays ago, the Saltworks dinner attracted a genial crowd of party-eager Southerners; the Israeli-inspired food was inventive if not always on the mark; and at the end, there was an unexpected twist–hordes of uninvited “guests.” Here’s the scoop..
2:38 PM: Our first glimpse of Bulls Bay in Cape Romain, a protected Class I Wilderness Area. 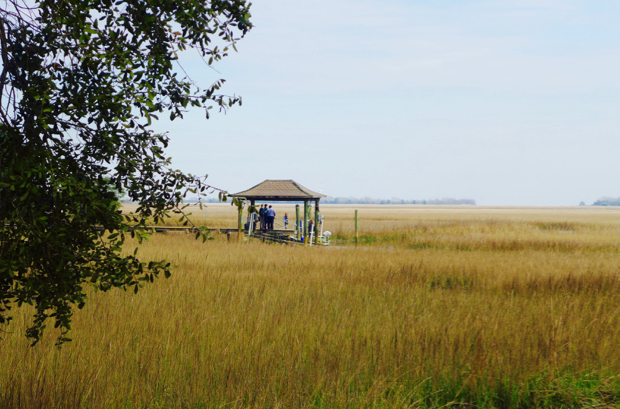 It’s a dreamy spot where salt marsh estuaries and wet lands form an ecosystem that shelters varied plant, fish and wildlife species. So that distant pavilion in a grassy field? It’s actually perched at the end of a long pier. A boat is tied to one of the pilings, ready to ply the waterways. 2:46 PM: Oh, thank God. That four-minute walk from the parking area was grueling. 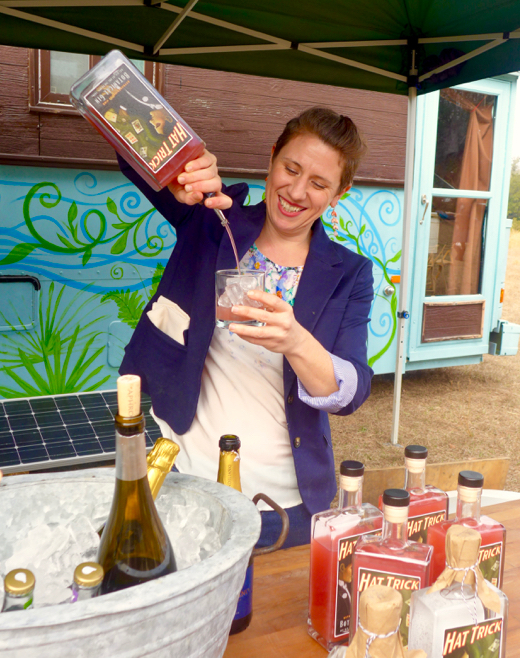 Fortunately Trace from Butcher & Bee, a buzzy Charleston restaurant, is making her version of a welcoming French 75: homemade strawberry syrup mixed with local Hat Trick gin, topped with a bit of bubbly. 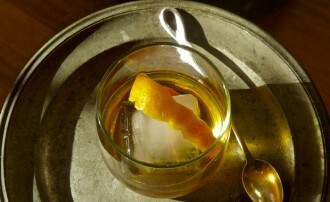 Delicious, even for a non-gin lover like me. Maybe too delicious. The gin swiftly works its magic, no thanks to all those “balancing” botanicals: licorice, angelica, coriander and cardamom along with crushed juniper berries and fresh lemon and orange peel. Oh I don’t know, maybe I’ll have another. 3:02 PM: Most of the crowd is dressed down: jeans, sneakers, sundry jackets and hats. 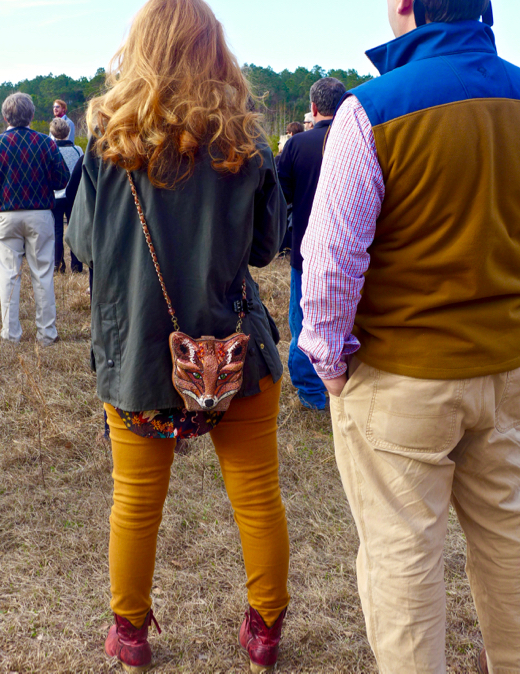 But not everyone: I love this woman’s tonal costume, soft trousers matching her strawberry blonde hair, battered red cowboy boots and the piece de resistance—a beaded foxy lady handbag nonchalantly slung over her back. Do you like that sparkly vixen? You can get a closer look right here. One thing that’s great about South Carolinians is their deep and abiding love for their canine companions. A voluble gentleman from Columbia buttonholes B, using his red Dalmation bow tie as a conversation starter. Within seconds we’re best of friends, trading real life stories about the antics of our springer spaniel and his fleet of Yorkies. 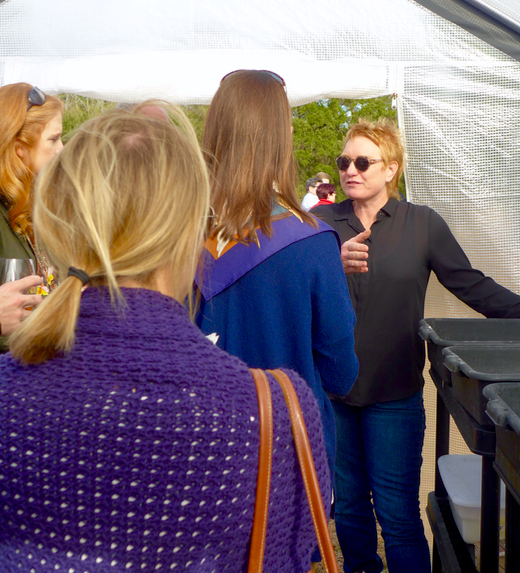 3:17 PM: We join the crowd listening to Teresa Gooden explain how pristine saltwater is evaporated in a “solar tunnel” to make premium sea salt. 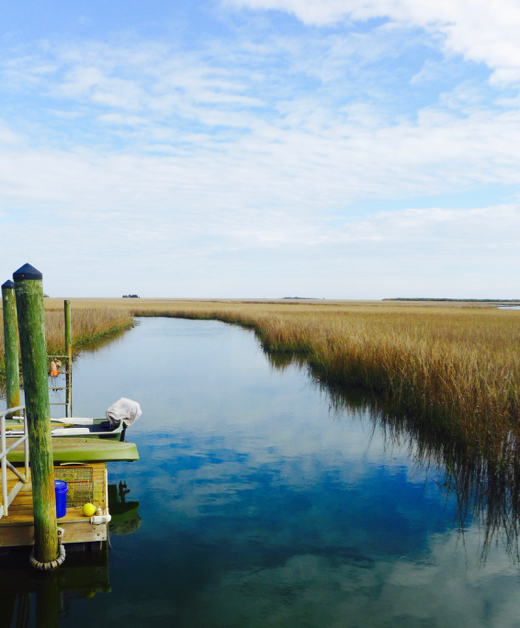 It all starts with the water itself, which is naturally filtered by clams and oysters living in the protected Cape Romain ecosystem. Gathered on on high tide, pumped into a holding tank and transported to the Goodens’ home greenhouse, the water is crystallized via solar and wind evaporation, then harvested by hand and set aside to dry. 3:33 PM: We wobble down the long pier (no handrails, too many French 75s) to join a couple who’ve driven down from Atlanta for the dinner. After taking each other’s pictures for posterity, we all look at the scene, gazing at the clouds reflected in the water. Out here, it’s utterly quiet and peaceful–a world away from the urban craziness most of us inhabit. No wonder Teresa and Rustin are always smiling. What a life! 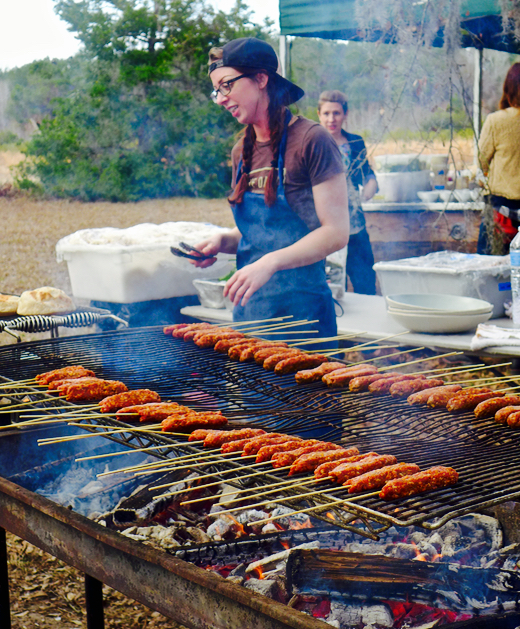 3:47 PM: Back on terra firma, B and I follow our noses to an outdoor grill where spicy ground lamb kabobs are starting to sizzle over glowing oak coals. Chesley Conrad, a chef at Butcher & Bee, is guest chef for tonight’s dinner. 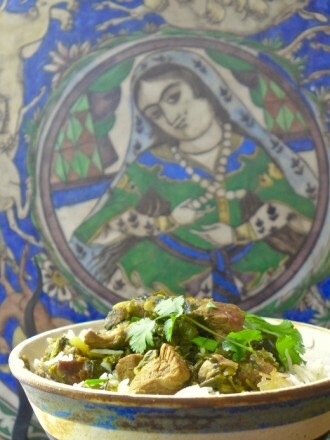 Almost all the food on the menu reflects the restaurant’s tilt towards Israeli cuisine, with seasonings such as schug, a fiery Yemeni spice blend, and pomegranate molasses enlivening mostly local ingredients. However, I notice cornbread and jalapeño vinaigrette have sneaked into an heirloom bean appetizer. 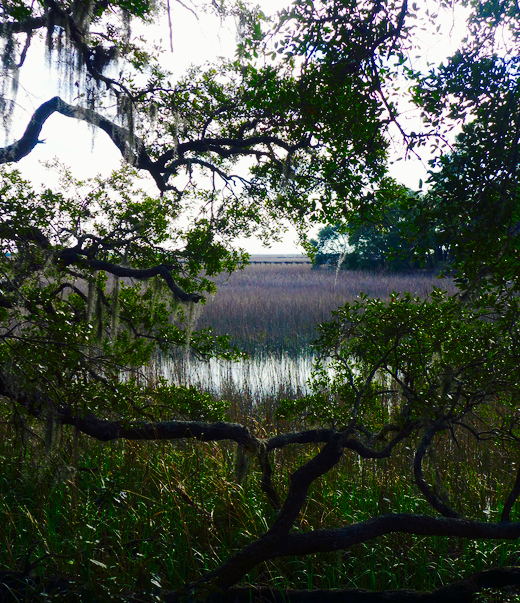 We plunk ourselves across from a nice couple who live somewhere south of Savannah. He’s a computer specialist for a private jet manufacturer, she writes blog posts for health websites. For each of us, there’s a gift packet of Saltworks bourbon barrel oakwood-smoked salt to take home. 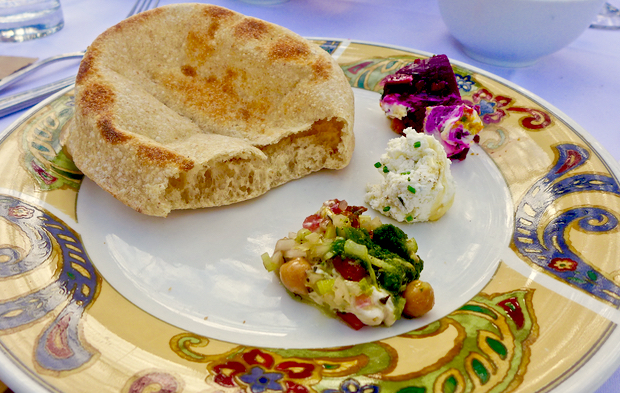 4:17 PM: Pita bread charred on the grill is a tasty way to sample the bowls of six starters. Two of my favorites: sweet heirloom beets with amba, a tangy Middle Eastern mango pickle, and labna, a thick salted yoghurt cheese; and whipped feta with fermented honey and cracked black pepper. 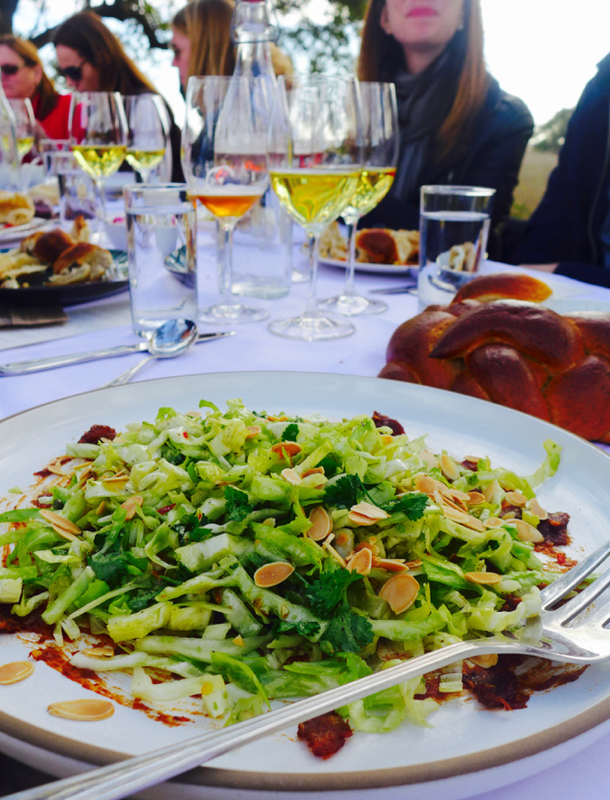 4:35 PM: This may be the most delicious cabbage salad I’ve ever tasted: tender leaves, shredded and topped with olive relish, sweet and spicy date chili and toasted almonds. Tangy pomegranate molasses drizzled around the edges adds another layer of Middle Eastern flavor. 4:42 PM: Meanwhile Patrick Emerson of Curated Selections is telling everyone about the natural wines we’re drinking. Emerson, a British born ex-thespian turned sommelier and wine merchant, extols the virtues of wines that, like the salt on the table, “taste like the place they come from.” That includes the softly acidic, almost citrusy 2013 Aphros Loueiro, Vinho Verde from Portugal that we had with the starters, followed by a fruity 2014 Huls Riesling Schieferspiel Trocken from Germany’s Mosel region. 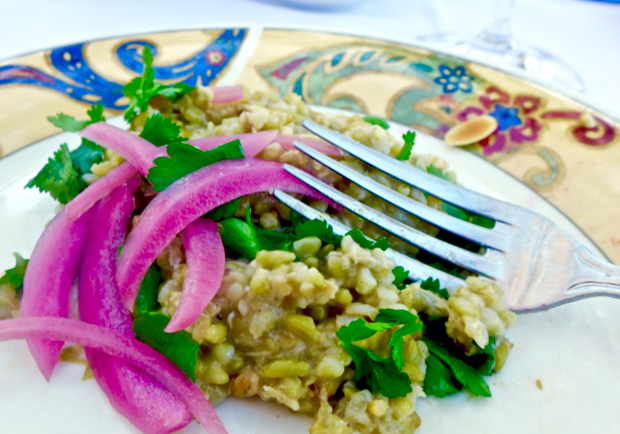 5:02 PM: My personal pick for best dish of the evening is the Freekeh Porridge with Smoked Keegan-Filion Farm Chicken. 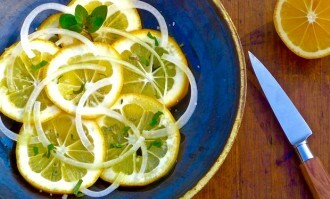 This homey dish made with soft green wheat is brightened by slivers of preserved lemon and pickled onion, while toasted almonds add crunch. 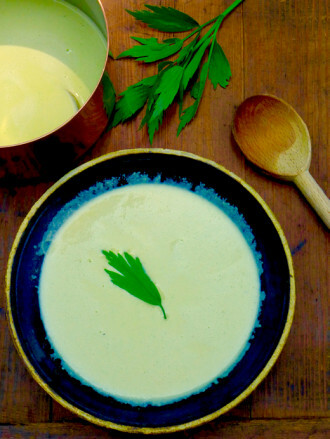 This is one recipe I really want: It’s the perfect comfort food for a Sunday night supper. Naturally B, well versed in the virtues of liquor as insect repellent, is totally unruffled. I haven’t been this miserable since I stirred up swarms of ravenous mosquitos while galloping through a field of sunflowers in South Texas. Now that the sun is setting, it’s getting very cold. 5:39 PM: Can it be that the evil gnats are also carnivorous? 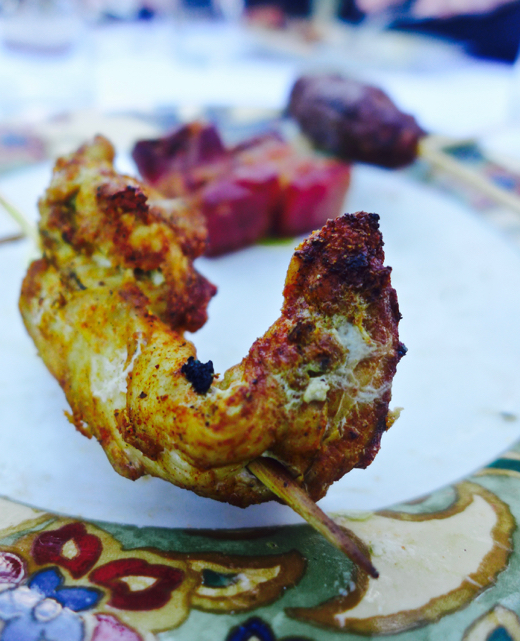 They’re certainly hovering over the chicken, lamb and beef belly kabobs on my plate. In between courses, people are leaving the table in droves. 6:08 PM: The vegetables to go with the meat course are lovely, but I can’t force myself to eat while battling the bugs. Food delivery has slowed to a crawl anyway—maybe they’re having problems in the cook tent as well. 6:21 PM: We’re giving up. 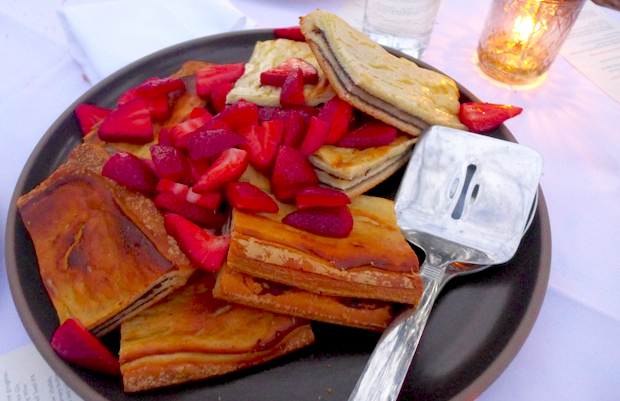 One bite of chocolate babka topped with strawberries, thoughtfully served by the light of a citronella candle, is plenty. We say a few goodbyes and slink into the darkness. Moments later, as we drive down the lantern-lit dirt road, I take a look in the rear view mirror. Yep, there’s a crowd of people running for their cars. Note to self: Never again attend an outdoor dinner without a case of gin. I mean insect repellent, of course…even in February! A mouthwatering narrative, makes me hungry even after breakfast! So many dishes I never heard about, I would love to expand my knowledge of middle eastern foods.